Let me say right up front that if you know more about Khyber Bazaar, please add that as your comments below. I’ll be glad to add them to this article. Khyber Bazaar was built right outside the Kabuli Gate, North West of the old walled city of Peshawar. 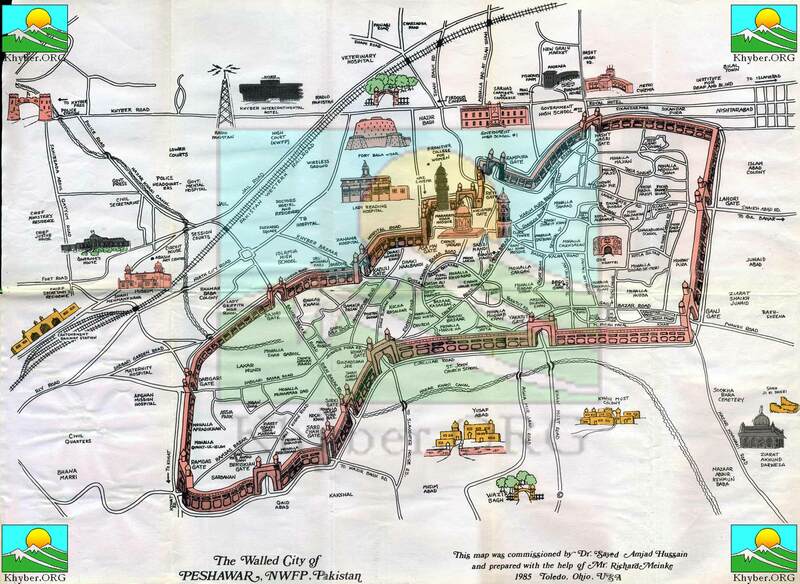 Yes Peshawar was once a walled city remnants of which still remain here and there. See inset and feel free to click and visit the site that posted this map originally. When was Khyber Bazaar built – I have not been able to dig that out. Surprisingly there isn’t much information available about Khyber Bazaar even though it is basically an extension of it’s famous brethren Qissa Khani Bazaar. What I’ll do is share my boyhood memories of Khyber Bazaar. Hopefully you can relate to it. I first visited Khyber Bazaar in the 1960’s when my father took me to Peshawar from our village. A trip to Peshawar was a big thing for us as we would get to ride the double decker Leyland buses operated by the now defunct GTS and get to eat exotic food. To us then, even fried fish was exotic. Those were simpler times. I remember my father treating me to falooda in Khyber Bazaar – a sweet concoction of Kulfi and noodles. Delicious. I’ve always had a sweet tooth so maybe that’s why I have fond memories of Khyber Bazaar. I remember my father buying a Karakul cap from a specialty shop there. That’s all the shop sold, Karakul caps. I was overawed with the rows upon rows of Karakul caps. My father loved to read so he would frequent a book store called the University Book Agency whenever he could. It was then the biggest book store in the province. A generation later, when I took my son to Pakistan for the first time, I went to Khyber Bazaar and asked if University Book Agency was still around. To my joy, it was and my son bought a copy of the Holy Quran there. It remains his favorite copy of the Holy Quran. When I was in my teens, our family moved to Peshawar and I would visit Khyber Bazaar on my bicycle on various errands. A couple of fish restaurants had opened then. All they sold was fish. I used to love eating those big slabs of fried fish. I wonder if they are still around. Last time I went to Peshawar, I went to Khyber Bazaar and took a detour into a side street called Jehangirpura and got some Chitrali Topai and Peshawari Saplai. I was also pleasantly surprised that quite a few smaller bookstores have opened up selling primarily Pukhto books related to regional literature and religion. It’s good to know people still buy books. Time goes by, some things change, some remain the same. When you are young, you don’t quite pay much attention to life around you. As times passes and you grow older, you are surprised by your own memories. How we remember so many places, shops, events, people and experiences. Feel free to share your experiences below. I’ll be delighted to post them.